MOSCOW, Russia -- Members of Russia’s political opposition published a posthumous report by the politician Boris Y. Nemtsov on Tuesday that documented the deaths of 220 Russian soldiers in the fighting in southeastern Ukraine, even though the Kremlin denies being involved in the war there. 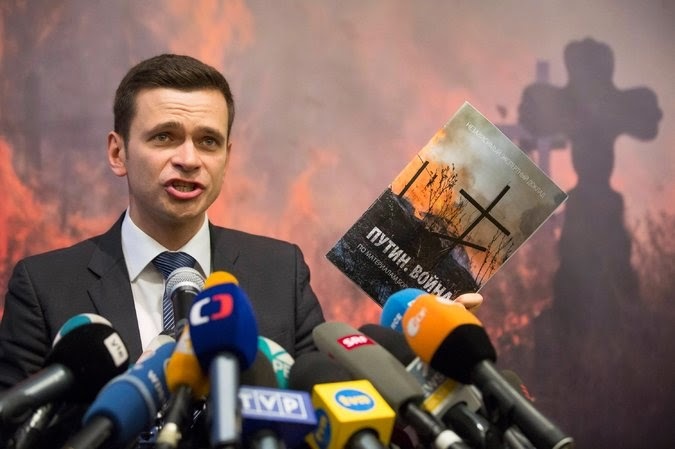 Ilya Yashin on Tuesday discussed a report that he says documents the presence of Russian soldiers in Ukraine when the Kremlin denied sending troops there. The report, which goes into various clandestine aspects of the war in Ukraine, became particularly noteworthy after Mr. Nemtsov, an opponent of President Vladimir V. Putin, was assassinated in February. A committee completed the 64-page work, called “Putin. War: According to the Materials of Boris Nemtsov,” which draws on handwritten notes and documents found after the shooting of Mr. Nemtsov, a former deputy prime minister and opposition leader, outside the Kremlin walls. Whether he was targeted for his work on the report is still unclear, and may never be fully known. Anna Duritskaya, a model and the girlfriend of Boris Nemtsov, witnessed his death. Colleagues used the release to praise Mr. Nemtsov and promote the report as shedding new light on the Russian Army’s interventions in Ukraine over the past year. “The report gathered definitive evidence of the Kremlin’s military intervention in the conflict in Ukraine,” Ilya Yashin, a political ally of Mr. Nemtsov and an editor of the report, said at a presentation in Moscow. “They can scare us, but they cannot shut our mouths,” Mr. Yashin added. After the fatal shooting of Mr. Nemtsov in central Moscow, the police detained five ethnic Chechens as suspects. But the investigation stalled there, as is the case in almost every politically tinged killing in Russia, and quickly dropped out of the headlines. Investigators had suggested that Islamic extremists targeted Mr. Nemtsov for defending the right of cartoonists to draw the Prophet Muhammad. The core of Mr. Nemtsov’s work had been in ascertaining whether the families of Russian soldiers who apparently died in the fighting in Ukraine were being paid death benefits. The report claims that about 150 Russian soldiers died in eastern Ukraine in August and an additional 70 or so in January and February, as separatists assaulted the Ukrainian-held town of Debaltseve. “Because your participation in this war is illegal, you and your relatives are without rights,” Mr. Nemtsov had written in a letter addressed to Russian soldiers last summer and republished in the report. Later, Mr. Nemtsov had been in touch with lawyers representing the families of 17 paratroopers from the city of Ivanovo who believed that their relatives had been killed in the battle of Debaltseve, but who had not received death benefits. They were told that the Ministry of Defense would pay death or disability benefits commensurate with those due a soldier. In other cases, benefits were apparently paid as promised, the report found. Families received a death benefit of about two million rubles, or about $39,000 at the current exchange rate. Elsewhere, the report largely walked through widely published accounts of a Russian presence in Ukraine, sometimes using humor. It highlighted Putin’s shifting explanations for the appearance of Russian soldiers in unmarked uniforms, the so-called Green Men, on the Crimean Peninsula. Putin called them “local self-defense forces” in March 2014. “Go to our stores, and you can buy any uniform,” he had said. The Russian Ministry of Defense denies that Russian soldiers are deployed in the eastern Ukraine regions of Donetsk and Luhansk. Mr. Yashin, Mr. Nemtsov’s political ally, took pains to point out that the report drew largely on public sources, other than the work on death benefits. The authors worked from materials found among Mr. Nemtsov’s belongings after his death, including “handwritten notes and documents,” according to the report, as well as from their recollections of his conversations about his intentions. It was an inevitably imperfect process, leaving it unclear whether Mr. Nemtsov had additional, perhaps more sensitive, information that had vanished after his death. “We cannot prove that Nemtsov was killed for preparing this report, and we cannot prove that he was not killed for this reason, as we are not investigators,” Mr. Yashin said. Nevertheless, he said, it was important to complete the pamphlet, so far as possible.